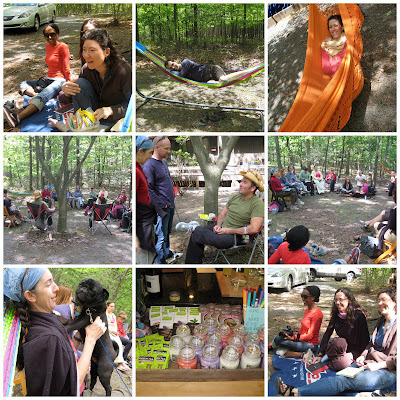 here are some shots from yesterday's teacher retreat at beau's cabin in west virginia. we did "show and tell" with what brings us tranquility (ex. mine was my pink tea mug that is always in tow), shared ideas on how to enhance the tranquil space experience (ex. offer yoga + hiking days), and reflected on ways to challenge ourselves as teachers (ex. new pose/class). since i believe you can't have an event without goody bags, i pulled together a goody tray for people to choose what they wanted. the items ranged from organic chocolate, scented candles, markers, green tea, incense, and chocolate face masks. tranquil space teachers are truly the most talented and dynamic beings i've ever met. honored and humbled to be in their presence. exhausted after playing hostess, i spent the evening reading living the creative life curled up in the hammock with louis the pug. true tranquility.